DAY 1-2: PORT MORESBY: Arrive Port Moresby International Airport. Freshen up at the Grand Papuan Hotel—Port Moresby’s most luxurious International Hotel—and enjoy icy cocktails in the warm tropical air on the rooftop bar. For those looking for an unparalleled tour of Port Moresby’s wild side, we’ve got local Huli guides to take us around the city streets and vibrant outdoor markets. Those looking for a gritty adventure rarely accessible to foreigners will have the opportunity to follow our Huli guides through the nighttime streets of POM’s Erema Candlelight City, chewing betel nut, drinking beer and playing highlands darts with a boisterous, energetic crowd of fellow Huli’s. Those electing to take this backside tour of the Capital City will be given a crash course in the labyrinth world of the PNG 'Wantok' system. Within moments of meeting our Huli friends, you will be introduced on the streets of Moresby as a 'brada/susa' (Tok Pisin), or 'hamane/wandari' (Huli language) which--quite perplexingly to us--literally means in both definition and sentiment that we are brothers and sisters. As everyone in PNG knows, Huli's make the very best friends and the most dangerous enemies to those who trespass against them. Needless to say, doors into the netherworld of Moresby culture swing wide for us in the safest of ways. DAY 3: FOGOMAIYU VILLAGE: Fly from Port Moresby to Mt. Hagen and transfer to MAF charter flight to the village of Fogomaiyu (2 hour of breathtaking twin-otter flight over pristine rainforest) and arrive to a warm cultural welcome in a Kosua Tribe ‘haus tambaran’ scenically perched on a small plateau above the mighty Kikori River. Here we’ll spend the day socializing with Kosua villagers, swimming and laughing with a swarm of the cutest children you’ll ever see and touring nearby butterfly and orchid gardens. Though our time in Fogomaiyu Village is short, the village will easily succeed in their effort to make us feel like honored guests in a gateway celebration to the rainforest paradise we'll travel through over the next 22 days. As we fall asleep in a thatched-roof house, the murmur of chanting voices and rhythmic drumming will seduce and reconcile our psyches with the collective tribal origin we all share. When we rise at daybreak to see the performers duck their lavish feathered headdresses and crimson painted bodies out of the spirit house door, it will feel as natural as waking in your own home and you'll know, quietly, that this is exactly where you are meant to be. DAY 4: OBOTE CAVE CAMP: Meet our guides and bag carriers early in the morning, lace up our trekking shoes tight and set out for the Obote Cave rainforest camp. The moderately rugged 4-hour hike to Obote will bring us through a beautiful rainforest along the side of a large creek to a bush camp nestled under a limestone cliff. After a warm welcome and introductions to our camp hosts, we eat lunch and walk a further 1 hour to the impressive Obote Cave. The yawning sinkhole entrance of the cave obscures to black as you peer down its depth in search for the bottom. Locals claim the cave sinkhole is over 300’ deep and so far, nobody has ever explored its depths. Nearby, though, there is an accessible cave adorned with immense limestone stalactites and stalagmites, the depths of which you can explore following a small creek into the darkness. On the way back to camp, we will hunt eelfish, crayfish and iguanas that if captured, will supplement our dinner of sweet potato (kaukau), taro, banana, sago and leaf greens. Guests can choose to sleep under the rock overhang with the camp hosts, or in their own tents. Kosua boys from Obote Cave camp putting on a show a the entrance to the cave. DAY 5-6: WAINE CAVE CAMP: Wake at sunrise and follow our carriers and local guide 6 moderately difficult hours to Waine Cave Camp near the southern land boundary of the Upper Kosua Tribe. We will stay in a remote bush hunting camp with an open-walled sago roof house that will serve as base camp for the area. Our main objective the first night is to help build the bush camp house out of surrounding rainforest materials and prepare Flying Fox bat traps utilizing the razor sharp thorns of the Lawyer Vine Cane. Group members have the opportunity to fully participate in the trapping of Flying Fox Bats as they fly--by the thousands-- out of the cave at dusk. Any bats we catch will be part of our wild rainforest dinner! The second day at Waine Cave will be spent exploring the flying fox cave we caught dinner above the night before. The dramatic entrance is a sinkhole 120’ deep that is adorned on the far side by a thundering waterfall which becomes the underground river that travels through a network of caves said to be 4 miles in total length. Accessing Waine Cave is not for the feint-of-heart. It will require the careful navigation of three sets of hanging ladders made of rainforest vines, each over 40 feet long. The reward is well worth the peril, however, as we pass beneath the waterfall and enter the 100’ tall cathedral of the main cave following the creek further into its hollow depths. All around us on the cave walls and ceiling we’ll hear the screech of the Flying Fox bats audible over the loud rush of the creek as we descend as far as time and comfort allows. Back on top we’ll eat another rainforest meal and sleep soundly amidst the cacophony of rainforest sounds. DAY 7: ININUAMO CAMP: After breakfast, we depart for Ininuamo camp. Wildlife abounds in this rugged 5-hour trek that traverses several ridgelines of untouched, pristine rainforest where our local guide will be busy pointing out strange and beautiful creatures along our way. We will arrive at Ininuamo for lunch, after which, visitors will have the choice of staying in camp learning basket weaving and string bag techniques, or splashing around in the plunge pool beneath a nearby waterfall. Accommodation here is similar to Wasi camp—open-aired bush house for gathering and tent for sleeping. DAY 8: LAKE KORABO CAMP Wake at sunrise and depart for Lake Korabo Camp. 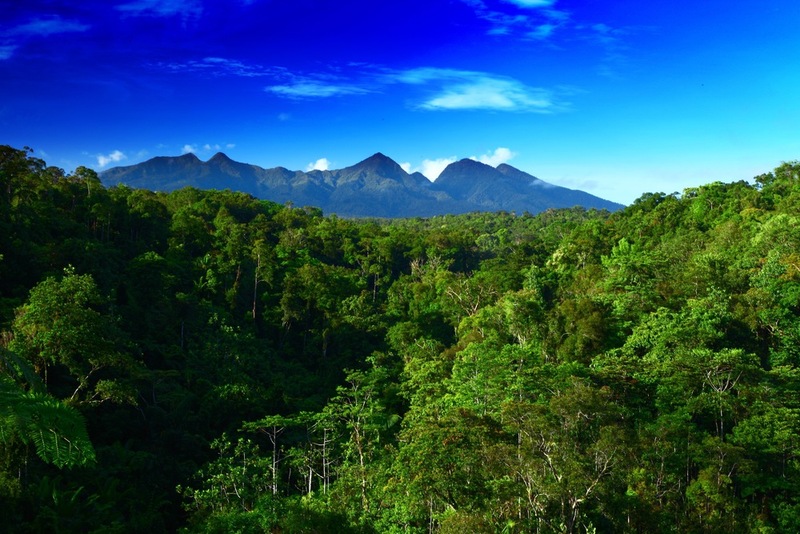 This is a moderate 5-hour hike through stunning, remote and little traveled rainforest. We’ll arrive at Camp for lunch, rest our legs for a bit and walk a further 20 minutes to Lake Korabo itself. In such a rugged, mountainous environment, lakes are very rare, giving rise to rich origin stories that come to life when told by the oldest living Kosua man. Think tales of tribal cannibalism told in viceral detail by a man who still remembers the taste of human flesh…These are riveting, fascinating and spine-tingling tales told for the first time to an outside audience. We’ll explore the lake and return to the camp for a wild meal of tree-grubs, wild game, beetles—Sago, sweet potato, leaf greens and pineapple for those comfortable with more familiar fare. The oldest living Kosua man who will share his colorful stories and song from the bygone era of widespread cannibalism. DAY 9-13: SEANE FALLS VILLAGE Wake at sunrise and depart for the village of Seane Falls. This is a moderately rugged 14km hike that traverses some beautiful rainforest ridges and crosses two pristine rivers. At our halfway point, we rest for lunch at a local hunting camp beside a river and tour some nearby waterfalls. After exploring these picturesque falls, we continue our journey to Seane Falls (4 hrs). After warm cultural welcome in the incredibly scenic ridge top village of Seane falls we’ll retire in our very own village bush house built on a thin ridgeline--just downslope from the village Spirit House—taking in some of the most remarkable views in Papua New Guinea including a 180° view of Mt. Bosavi. We’ll stay in the traditional and remote village of Seane Falls for nearly a week and immerse ourselves in the daily life of a Kosua village. You’ll experience unique cultural sing sings in their natural setting (Spirit House) that often last through the night. Group members can use the time in the village to pursue whatever their interest is—birdwatching, waterfall exploring, rainforest treks with village naturalists, daily activities such as hunting, fishing, sago making, gardening, gathering, etc. In Seane Falls, you are free to live among some of the friendliest people on earth and have access to the unrivaled privilege of immersing yourself as completely as you wish in their spirited culture. Your guide is there to take as much or as little involvement in your interactions with the community as you wish. DAY 14-19: BOSAVI CRATER EXPEDITION: Bosavi Crater is too incredible to attempt to describe every detail of this journey and is likewise too dynamic and challenging an environment to have any hope in producing a reliable itinerary, so we'll just highlight the things visitors need to prepare for. The trek from the village of Seane Falls to the Crater Rim is close to 20 Kilometers and 5,200 feet elevation gain. The ‘trail’ is rugged and exhausting and we will likely be drenched in rain. Temperatures at this elevation drop to around 45-55 degrees, which means it will feel cold. It’s important to prepare for this part of the journey both physically and mentally as this environment is among the most formidable anywhere. We stay the night on the Crater rim in a tarpaulin house already set up in preparation for our arrival. We’ll have a free day to summit crater peaks (relatively moderate hikes with some exposure), observe unique, bizarre and rare wildlife living in the surrounding cloud forest and rest our legs for the epic 1km vertical climb down (weather permitting) the next morning. This is the part of the journey that is truly expedition style—the Crater bottom is close to 3,000 feet deep and the upper 1,500 feet drop is dizzyingly steep. Our Kosua Guides understand the risk and are extremely concerned with our safe passage, so with their trustworthy assistance, we’ll be safe as can be, however, this part of the trip will be impossible for people with fear of heights or fear of exposure. We’ll arrive at our Crater basecamp after 4 hours of exhilarating trekking. Once established in our rainforest camp, weather will determine our activity inside the Crater. With over 400” of rain falling each year (over 8” can fall overnight in the Crater), streams can turn into raging cataracts in a matter of hours, hindering travel as the Crater bottom is a maze of creeks and rivers. When the weather is good, we will explore, gather wild foods (minimal hunting in the Crater—as per Kosua legend and rule), look for unique species found nowhere else (including the rumored flying Cassowary yet to be documented, the newly documented 'fanged frog' and the giant Wooly Rat), and generally take in the atmosphere of what may very well be the most pristine landscape on earth. The trek out feels easier than on the way in and we have an option on staying on the rim again or making the day a very long one and trek all the way back to the village. DAY 20: SEANE FALLS VILLAGE At the conclusion of our stay, we’ll partake in a celebratory pig killing and singsing to celebrate our new friendships and safe passage in the Crater. This is a poignant farewell ceremony that will feature performers from many of the bush camps we've stayed with previously on our journey. By this time, your comfort with the Kosua Tribe will be natural and easy and you'll have the unparalleled chance to involve yourself as deeply as you wish in the preparations and performance of the celebration. Ever wanted to adorn traditional tribal clothes and pound a lizard-skin drum in a spirit house lit with the flames of bamboo torches? How about having a second wedding with your spouse in full tribal regalia? Help butcher a pig with bamboo knives? Get your septum pierced with a Sago Palm thorn? How about bringing home a hand-tapped tattoo crafted by a Kosua tribe woman? It is up to you how deeply you travel in Kosua Culture. DAY 21: WASANA CAMP After an emotional morning farewell, we walk to Wasana Hunting Camp with a guide and bag carriers (5 hours moderate rainforest trek). Wasana is located in a protected forest called the Libano Wildlife Management Area. Rules restrict hunting, gathering and gardening techniques and as a result, the environment in this area is primeval. The camp sits on a ridge top overlooking the mighty Kikori River and surrounding rainforest. We will stay in our own bush house with attached deck that commands 180° views of the surroundings. DAY 21-22: WASANA CAMP Stay at Wasana Camp and join local experts on dugout canoe fishing trips, traditional bow and arrow hunting trips, food gathering trips, or try your skills in a one-person dugout in one of the many oxbow river lakes nearby. If the Libano River is clear, fly-fishing aficionados have the exciting chance of hooking into a mighty Barramundi, or a 7lb poison-fin 'shark fish.' Those looking for more tribal flare will have a chance to shoot fish from the bow of a dugout canoe with a traditional bow and arrow. Brave hunters can join an all-night hunt for giant crocodiles using bow and arrows and other traditional weapons that will require nerves of steel to employ. Only the most traditional hunting methods may be used in the WMA, making this a culminating opportunity to test your tribal skills at the end of your three-week immersive experience. Wasana is a special place for us to visit and your time with the small family who reside there will not be forgotten. DAY 23: KIKORI RIVER After a hearty breakfast of steamed and smoked fish, we say farewell to the friendly faces at Wasana Camp and load ourselves and our gear into two large dugout canoes (40+ feet long) and set off down the swift and powerful Kikori River. This is the part of the journey that requires group participants to be very strong swimmers. There are no lifejackets and the river is huge. That said, our boat captains are experts, having grown up on the bank of the Kikori with several 1000 lifetime hours navigating traditional canoes with people and cargo up and down the river. It is nearly 4 hours boat travel back to Fogomaiy’u where we’ll catch an early-afternoon flight to Mt. Hagen and on to Port Moresby where we conclude our stay in the opulence of a hotel. DAY 24: INTERNATIONAL DEPARTURES Say goodbye to your guide and depart on respective flights home. *Due to the remote and undeveloped nature of our expedition, this itinerary may not precisely reflect the exact itinerary of your trip. We can assure that your experience will be unrivaled either way, but we cannot account for nor predict weather circumstances, tribal events (funeral, injury, etc.) and unique and exciting opportunities that present themselves along our way that may alter our route or timing. Rest assured that each highlight in the above itinerary will be included in your journey, regardless. **Malaria is present in Papua New Guinea and while mosquitos in the Bosavi area are actually quite tolerable (even without repellant), it is advised that you take anti-maliarial medicine while visiting. Despite the relative inconvenience of the every day dosage of Doxycycline, we recommend this anti-malarial because it also acts as a mild consistent dose of antibiotics that helps prevent Tropical Ulcers and Staff infections from developing in the small insect bites you swore you would never scratch. Bosavi trips will ideally depart between November and April (dryish season locally) while custom tailored trips in other locales around Papua New Guinea are available to depart between April and November.